AC Products (Pty) Ltd was established in 1996 manufactures Anti Corrosion protection material for underground steel piping widely used in Municipalities, Mines, Civil construction of all pipelines for water, chemicals, gas and petroleum products. 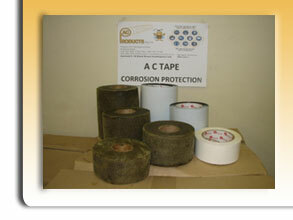 AC Products currently manufacture corrosion protection tapes, primers, paste and mastics. Petrolatum tape is ideally suited corrosion protection off all steel and copper piping used for underground as well as above ground applications such as water reticulation, fire hydrants and Gas and Chemical lines. Petrolatum tape and VCI paper ( volatile corrosion inhibitors ) is also widely used in corrosion protection and prevention on steel and other metal components for preservation in storage or for equipment to be exported and shipped by containers. AC Products also supplies a vast range of civil and construction product from Sika, Pekay and other manufacturers. In addition to our range of corrosion protection products AC Products (Pty)Ltd also supply the whole range of PPE – Personal Protection Equipment- .AC Products supply all Work wear Overalls, Conti-suits, Boiler suits, Flame retardant overalls, Acid resistant overalls, dust coats, work pants, shirts and jackets, corporate branded clothing with silk screen printing or embroidery. AC Products (Pty)Ltd supply the following personal safety protection equipment. Gloves. Chrome leather gloves, Welding gloves, Green lined welding gloves, Heat resistant gloves, PVC gloves, Rubber gloves , Nitrile gloves, Pig skin gloves, Rigger gloves, Chemical gloves, Kevlar cut resistant gloves, Electrical gloves, Commarex gloves , Candy stripe gloves and many more. Safety Shoes and Safety boots with steel toe caps or without. AC Products supply the whole range of Bova, Lemaitre, Rebel, Bata, Bell and CAT. Safety specs and eye protection with a range of products ranging from spectacles with anti fog, anti scratch properties to safety goggles for dust, impact and chemical protection. Respiratory protection from disposable mask for dust, mist and fumes FFP1, FFP2, FFP3 with or without valves, Half mask and full face masks for all applications. Ear protection with disposable ear plugs, reusable earplugs corded or uncorded and ear muffs. High visibility clothing with reflective tape and day glow fabric in reflective vests, bibs, reflective jackets with optional silkscreen printing or embroidery. PVC aprons, chrome leather aprons, Chrome leather welders jackets, yokes, spats,Safety helmets, hard hats and caps, face shields, welding helmets, auto darkening welding helmets Safety harness, parachute.